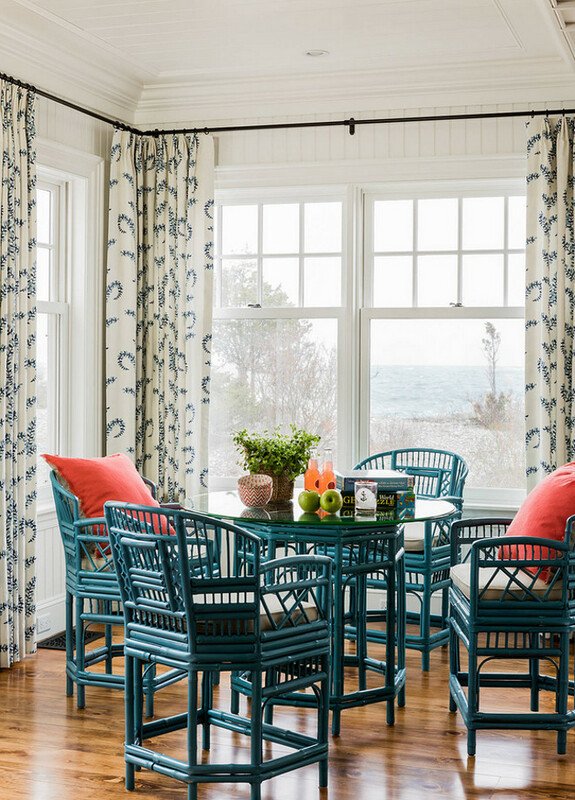 Beautifully and colorfully designed by Katie Rosenfeld Design, this ocean-front shingled Gambrel style beach house with coastal interiors is home to a young family with little kids who lead an active, outdoor lifestyle. The designer’s goal was to create a bespoke, colorful and eclectic interior that looked sophisticated and fresh, but that was tough enough to withstand salt, sand and wet kids galore. The palette of coral and blue is an obvious choice, but the designer tried to translate it into a less expected way. 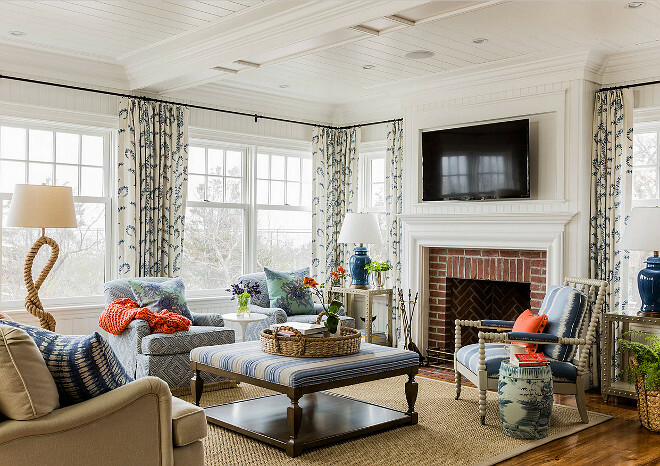 Liberal use of indoor-outdoor fabrics created a seamless appearance while preserving the utility needed for this full-time seaside residence. 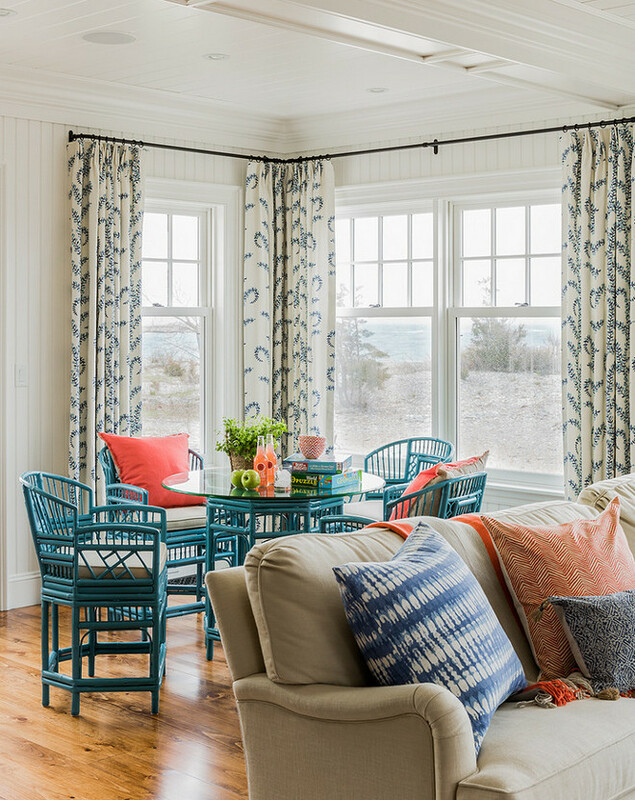 I hope the coastal interiors of this beach house inspire and warm up your wintery days this week. 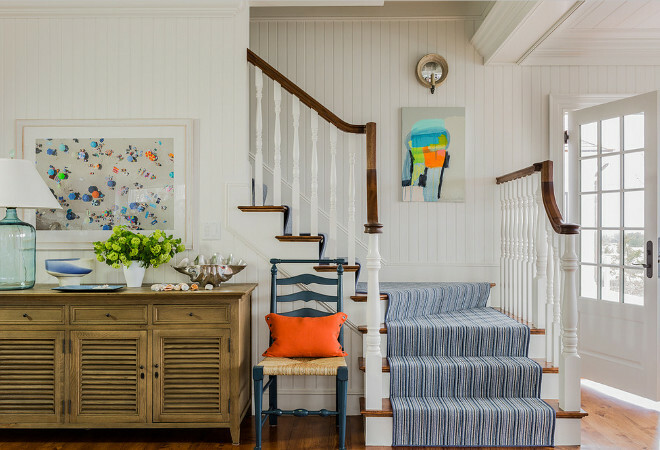 This coastal foyer is perfect for a beach house. Tongue and groove walls frame a Restoration Hardware sideboard. Paint color is OC-17 White Dove by Benjamin Moore. 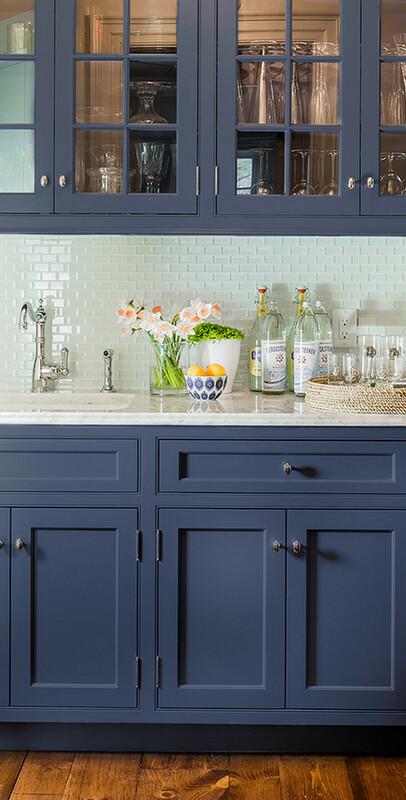 Photo above sideboard is by Gray Malin. I adore his work and I’m often recommending it to my clients. Glass jar lamp is a vintage find. Isn’t it gorgeous? 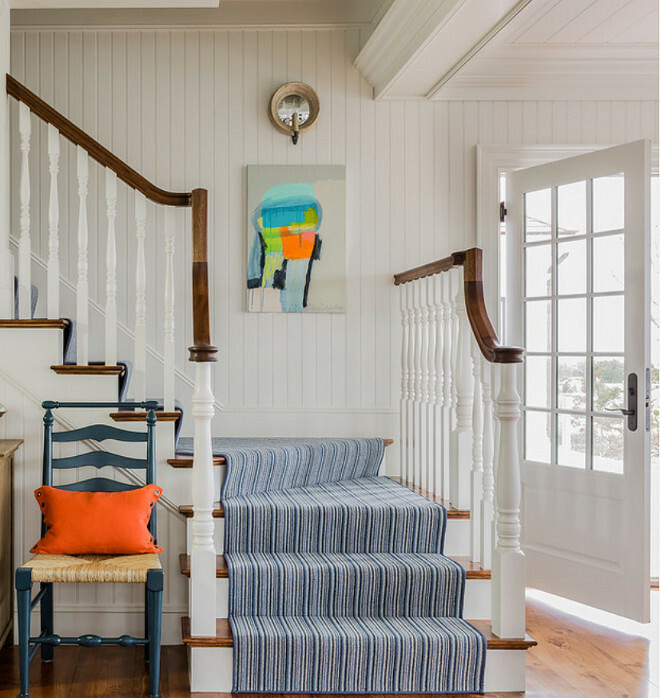 The 100% wool stair runner is Joella by Stark Carpet. 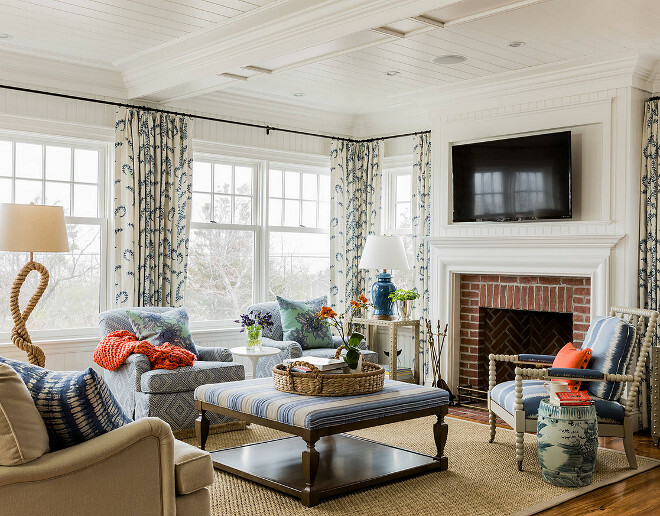 The formal living room has a sophisticated feel but it still feels approachable. 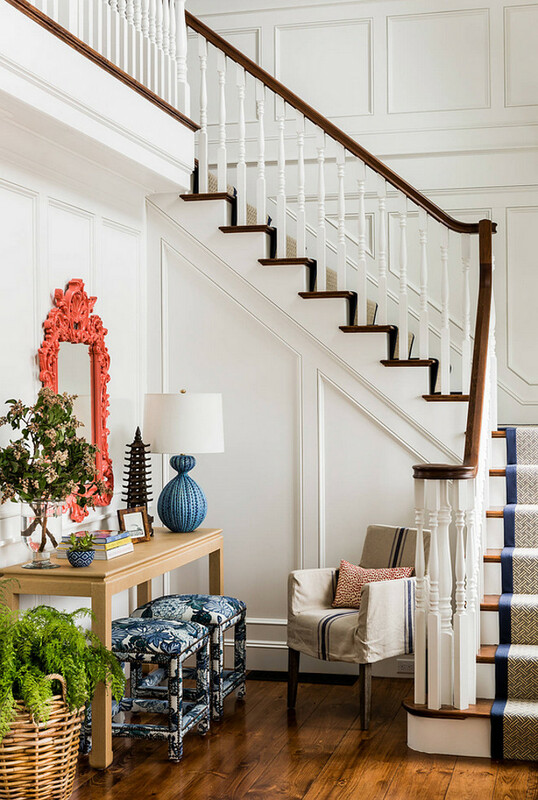 I’m loving that classic fireplace and the coral chairs. The coral chairs are by Duralee. The blue and white chair was custom designed from Wesley Hall in a F. Schumacher & Co. fabric. Rug is a very old Ben Ourain Moroccan rug from Doris Leslie Blau in NYC. 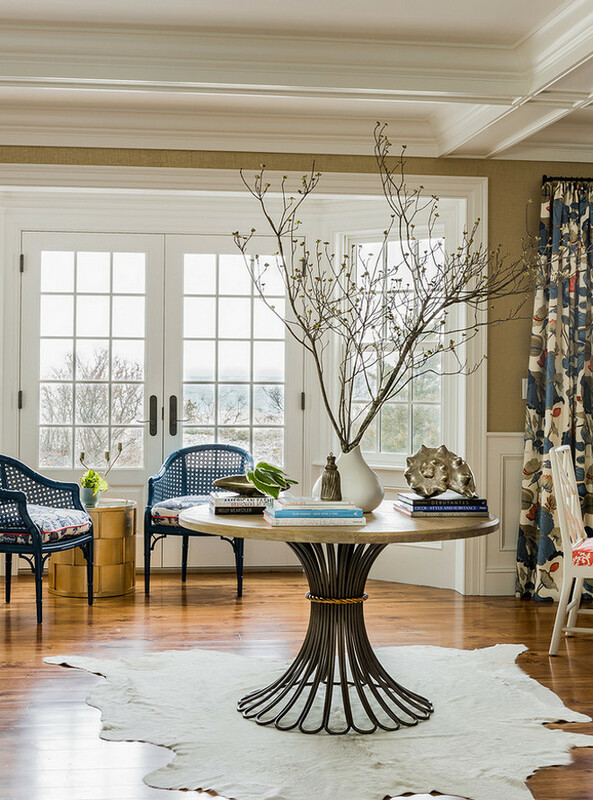 A round table by Bunny Williams Home divides the living room from dining room. The caned vintage chairs were found by the designer in Florida. Aren’t they beautiful? Anyone can feel welcome in this vibrant and warm dining room. Lighting is Arteriors Southampton Shell Chandelier. The stunning blue and white table lamp is Brush Stroke Lamp (Blue) from Bunny Williams Home. The lamp costs around $950.00. 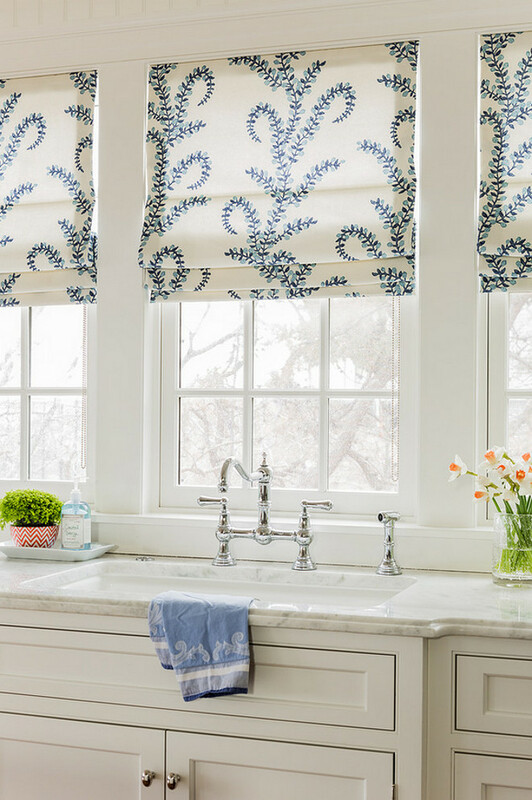 The draperies were custom designed by the designer’s workroom using Nympheus in Marine by Lee Jofa. 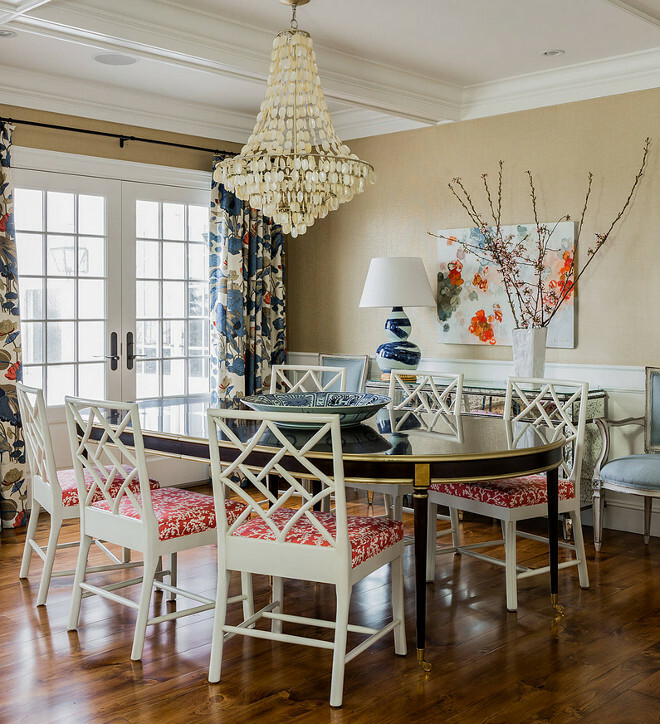 Dining table and chairs are from Hickory Chair. Floors are Heart Pine with a custom stain color. “Farrow and Ball Drawing Room Blue”. 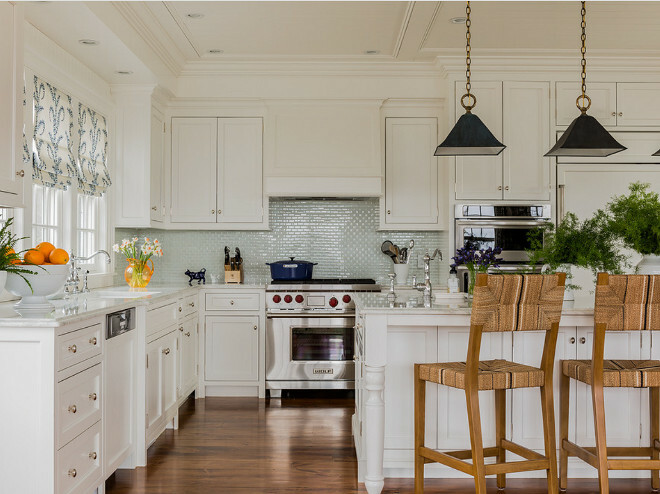 The kitchen is one of my favorites rooms in this home. 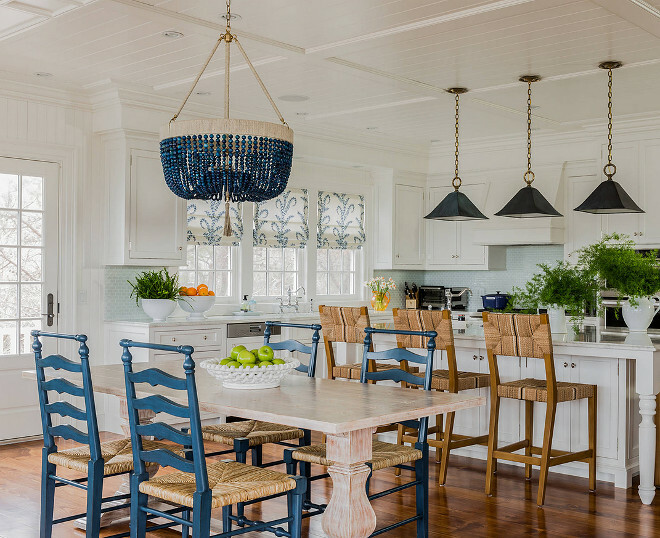 Truly, you can never go wrong with a blue and white kitchen in a beach house. Kitchen pendants are Gibson MM 8015 from Urban Electric. Barstools are from Serena & Lily. Kitchen paint color is “Benjamin Moore White Dove”. Backsplash tiles are by Artistic Tile. 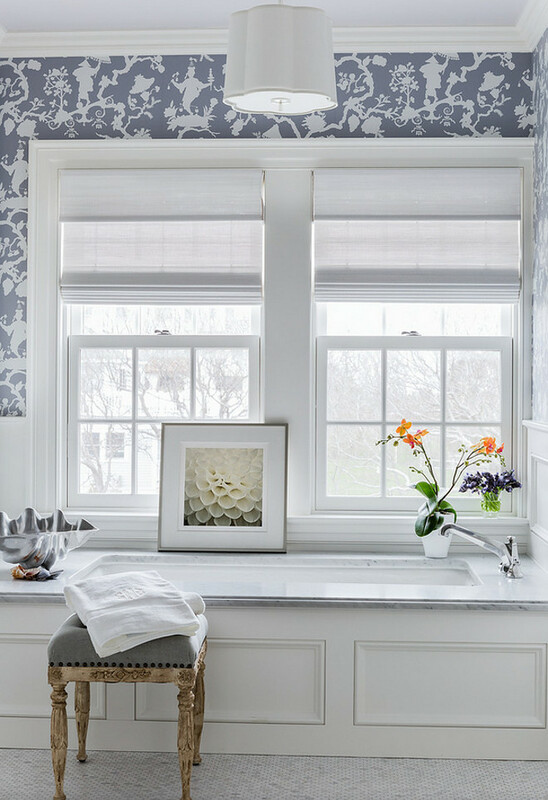 The fabric used to make the window shades is “Duralee 21037 Prasana Bluebell”. 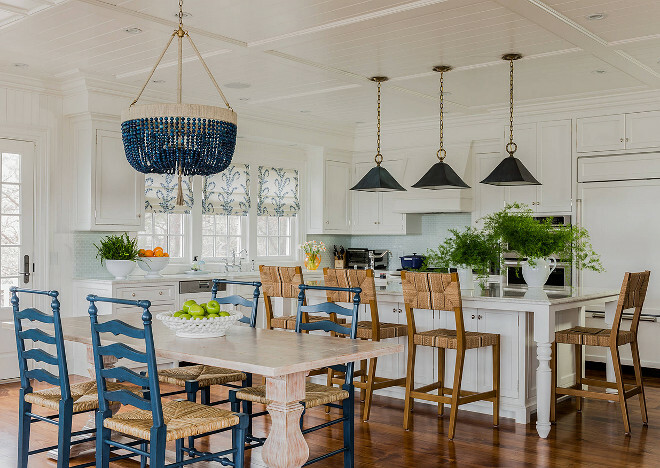 The navy blue beaded chandelier is the Blue Agate by Ro Sham Beaux. Table is from Somerset Bay. The family room is where I would spend most of my time if I lived in this home. I love the decor and the comfy furniture. Wall color is “BM OC-17 White Dove”. The ottoman is Wesley Hall. Fabric is GPJ Baker through Lee Jofa. Rug is Pecola Sisal from Stark Carpet. 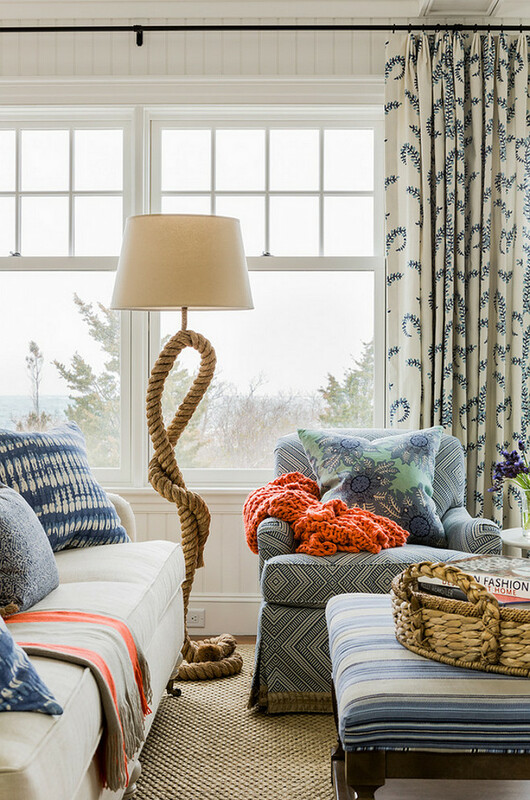 The rope floor lamp is from Pottery Barn (discontinued). The fabric on the pillows are Raoul Textiles. The chair fabric is by Schumacher and it’s indoor/outdoor. Rods are custom welded wrought iron rods. The drapery fabric is once again, Duralee 21037 Prasana Bluebell. The teal wicker rattan table and chairs are vintage. The stair runner is Stark Darryl Denim with custom navy wide binding. 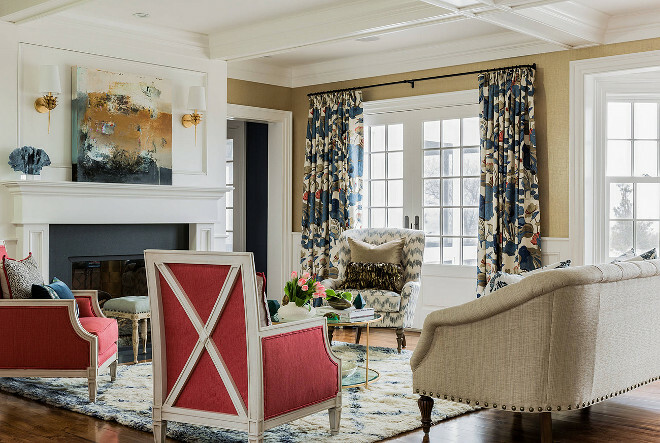 This space also features a beautiful custom-made console table, Lee Furniture stools, covered in Schumacher Chiang Mai Dragon in China Blue fabric and a French grain sack slipcovered chair. Table lamp is Gannet from Visual Comfort. 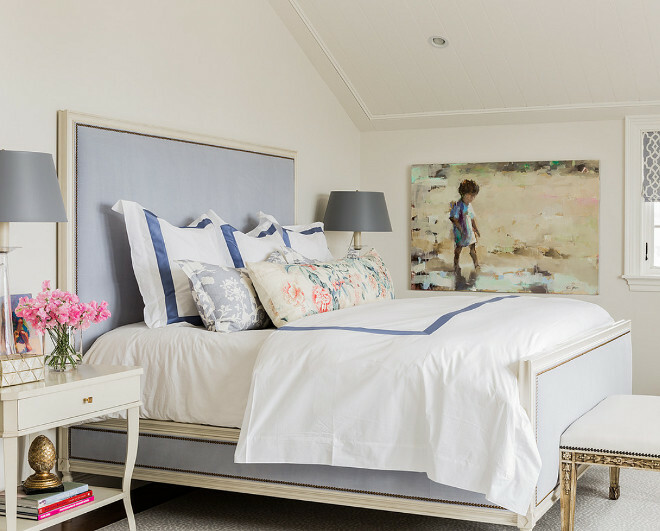 The furniture used in this bedroom is timeless! I also love the serene color palette. Wall paint color is “Farrow and Ball Strong White”. Bed is Candler Bed by Hickory Chair. Nightstands are West Paces Nightstand, also by Hickory Chair. Carpet is Sark Carpet Kubra, and fabric on windows is Schumacher. What a great bathroom! 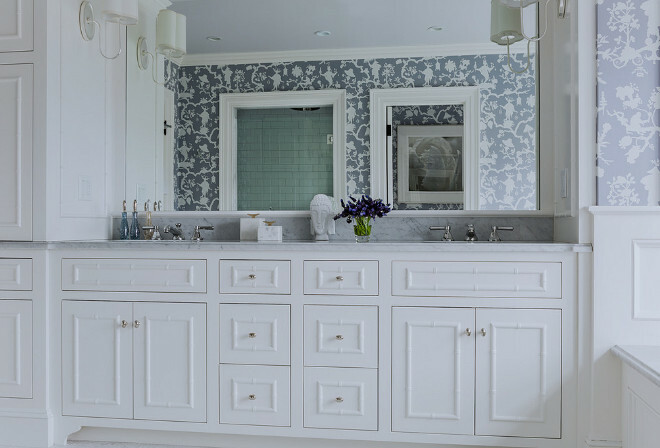 The designer found the bamboo moulding and applied them inset to the custom cabinetry. Isn’t this an inspiring idea? Can you picture yourself relaxing here at the end of the day? 2016 just started and it’s going pretty good so far. I feel refreshed after taking a good break from projects and a short break from the blog. Honestly, I can’t wait to start working and creating again. This week should be wonderful! I have plenty of work to do around here and I should start removing some of our Christmas decor. Do you guys still have yours up? I hope you guys are feeling great and have a wonderful week. Be open to have fun, laugh and enjoy this Blessed New Year! Sources: Katie Rosenfeld Design. Photo Credit: Michael J Lee. am renovating a beach house and your posts have given me so many ideas (and wishes!!!). Thanks! Love this blog. I am wondering what the color is on the teal wicker vintage table? Thanks so much! I love it.